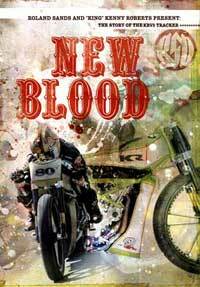 New Blood is a documentary about the building of the KRV5 Tracker, which Roland Sands built after the Kenny Roberts race team boldly handed him one of their KRV5 MotoGP engines, and said “build something”. Roland Sands, now a custom motorcycle builder, is a former 250GP Superbike National Champion, and knows very well what a GP engine is made for. So instead of just slapping the engine in a “MotoGP” themed chopper, he builds a motorcycle that’s true both to the custom motorcycle scene, and the racing origins of the engine. The DVD shows the thought process from the beginning to the final result. That ends up with a bike inspired by historic board track race motorcycles. The building process is more or less as you know it from Discovery Channel, with a few extraordinary moments, like how they make the bike look sleek with an engine that is much wider than the usual v-twin engine used in custom motorcycles. One of the most interesting parts of the DVD is when they take the Kenny Roberts MotoGP bike for a test ride in a flood control facility (for lack of a proper race track). Their enthusiasm really shows through. How wouldn’t you feel if someone dropped of a cutting edge GP motorcycle in your driveway (other than scared shitless of twisting the throttle)? The final part, when Roberts and Sands test the finished KRV5 Tracker on some twisty mountain roads is pretty wicked. The looks of the machine is absolutely stunning, and since they can’t stop having just one more go, it’s obviously devilish fun to ride as well. All in all, if you like the build-off shows, you will enjoy this DVD as well. Except this one is kind of special because of the, mildly understated, “exotic” engine used in the build. The DVD is distributed by the cool guys at Choppertown, who you might know from their documentary on The Sinners. Oh, yes. I will be having that.